Dr. Gailyn Van Rheenen served as a church-planting missionary to East Africa for 14 years, taught Missions and Evangelism at Abilene Christian University for 18 years, and is the founder and currently a facilitator of church planting and renewal within Mission Alive (www.missionalive.org). 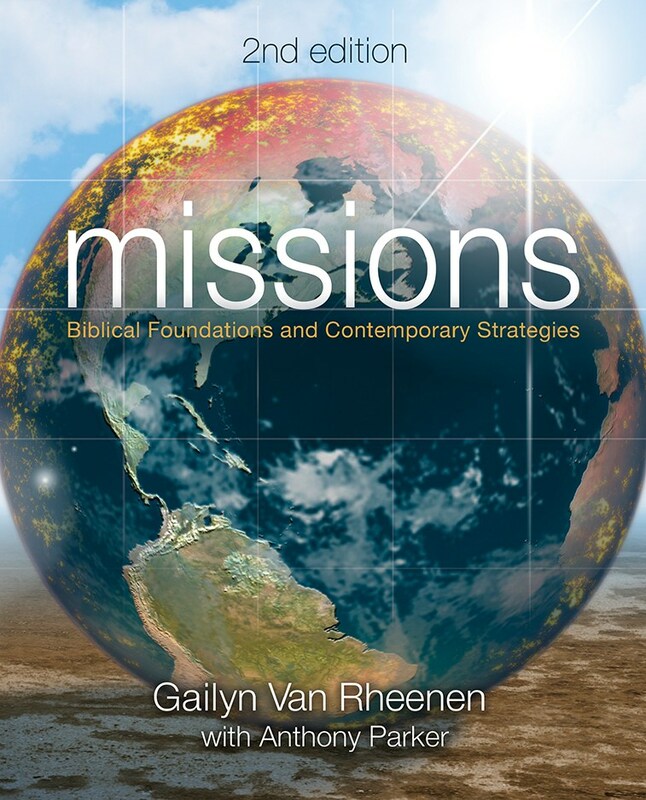 The second edition of his book Missions: Biblical Foundations and Contemporary Strategies was published by Zondervan/Harper Collins in 2014. Other publications include Communicating Christ in Animistic Contexts (William Carey Library) and The Changing Face of World Missions (Baker Academic; authored with Michael Pocock and Doug McConnell). MR#9 Can Local Churches Effectively Select and Care for Missionaries? 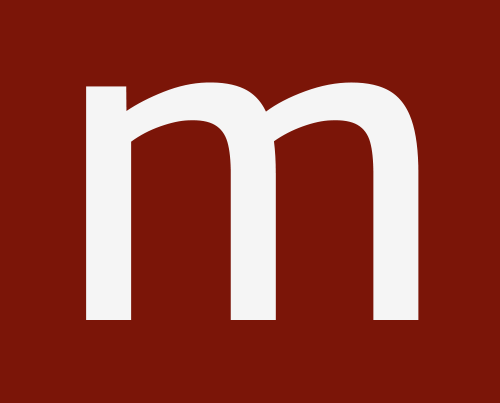 MR#27 A Strange New Voice: Who are Missional Leaders? Before and After: The Homewood Story -- Missiological Reflection #1 (January 2000) Bob Hofer of the Homewood Church of Christ in Birmingham, Alabama, describes his congregation's effectiveness in missions as a "before-after story." After switching from a reactive to a proactive model, Homewood has become one of the most active and effective missions-sending churches in North America. Money and Mi$$ion$ -- Missiological Reflection #2 (February 2000) In the study of Missions it becomes apparent that the use of money is like a two-edged sword: It can empower missions on the one hand while hindering or destroying it on the other. Why Missionaries Fall -- Missiological Reflection #3 (March 2000) Most "regular church people" perceive missionaries to be super-saints, just a little lower than Jesus. They surely could not sin! But the reality remains that many missionaries do fall into sin. How does this affect the kingdom of God and what can be done to prevent it? Dr. Van Rheenen explores this topic in this month's reflection. Missionaries: Pastors or Apostles? (Part 1) -- Missiological Reflections #4 (April 2000) When an evangelical missionary in Guadalajara, Mexico was asked what one thing he would do differently if he were beginning all over again, he replied, "If I were to start all over again, I would adopt an apostolic rather than a pastoral role." 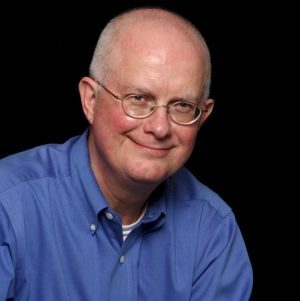 Dr. Van Rheenen discusses the differences between pastoral and apostolic ministry in this month's reflection. Missionaries: Pastors or Apostles? 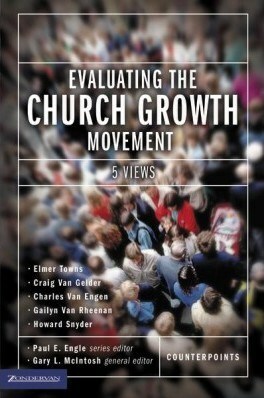 (Part 2) -- Missiological Reflection #5 (May 2000) Missionary strategist David Garrison says that the goal of missions should not be planting churches but the “beginning and nurturing of Church Planting Movements among all people.” Dr. Van Rheenen examines Garrison's book Church Planting Movements in this month's reflection. Doing "Missions" Without the Local Church -- Missiological Reflection #6 (June 2000) Many missionaries are sent out by para-church organizations to translate the Bible into vernaculars, dispense aid to needy people, enhance the development of nations, and train national church leaders in a school settings without significantly relating to national churches or their leaders on the field. Christian missions is done without personal connection with local churches in either the sending or receptor nations. In this month's reflection, Dr. Van Rheenen explores this phenomenon and its ramifications. The Church: A "History-Making Force -- Missiological Reflection #7 (July 2000) How does the church, despite her weak appearance, serves as a history-making force? In this MMR Dr. Van Rheenen describes how the church becomes a history-making force by interpreting God's designs and challenging the false allegiances of the world. Missions: The Salvage Operation -- Missiological Reflection #8 (August 2000) Dr. Van Rheenen is continually searching for metaphors that graphically illustrate different aspects of missions. This Missiological Reflection compares a missionary-active church to the crew of a salvage ship. The captain, divers, technicians, and other crew members all work together fulfilling their complementary roles in the work of retrieval. Can Local Churches Effectively Select and Care for Missionaries? -- Missiological Reflection #9 (September 2000) Do local churches, with limited understandings of missions and of the world, have the knowledge and the skills to effectively strategize for world missions? Or must this task be left to missions agencies? Dr. Van Rheenen explores this fundamental missions issue in this month's reflection. Maintaining Missionary Health -- Missiological Reflection #11 (November 2000) How can churches in the United States provide adequate nurturing and support for missionaries thousands (or even hundreds) of miles away? What are the missionaries' needs, and what are the available methods to help meet those needs? Dr. Van Rheenen approaches this important subject in the November Missiological Reflection. Church Planting Is More Than Pioneering -- Missiological Reflection #12 (December 2000) The need for church planting has disappeared from the radar screens of many North American churches. It has become a specialized art done by professionals--beyond the capacity of local church people. In this Missiological Reflection Dr. Van Rheenen describes five types of church planting to heighten understanding and provide motivation. Money and Mi$$ion$ (Revisited) -- Missiological Reflection #13 (January 2001) The month’s reflection continues the discussion of money and missions by defining paternalism, describing two historical models for dealing with paternalism, and finally offering specific questions to help evaluate the use of money in missions. The Rise of Folk Religion in the 21st Century -- Missiological Reflection #14 (February 2001) "Years ago missiologists forecast that folk religion would fade away when participants either became a part of some world religion or learned that their beliefs were based on superstition. Folk religion, however, has not died but has reclothed itself in new garments and has returned with a vengeance. In this month's reflection Dr. Van Rheenen examines this religious phenomenon as he observes ceremonies dedicated to worshipping Yemanja, the goddess of the sea Yemanja in Montevideo, Uruguay." Using Money in Missions: Four Perspectives -- Missiological Reflection #15 (February 2002) Too many mission-sending churches and agencies operate with no model for the use of money in missions. Their missiological decisions about finances are, therefore, likely to be inconsistent, haphazard, and paternalistic. In this MMR Dr. Van Rheenen presents uses, limitations, and abuses of four models for using money in missions. A version of this article will appear in the January issue of the Evangelical Missions Quarterly. Ego: Impediment to Missions -- Missiological Reflection #16 (March 2002) Human ego stands as a formidable obstacle to effective missions. Christian ministers with immense talent and creativity flounder when they rely only on their own power. In this MMR Dr. Van Rheenen describes three ways that missionaries and ministers respond to God’s mission: despair, pride, and reliance on God. He analyzes 2 Cor. 4:7 to demonstrate reliance on God. Transplanted and Contextualized Churches -- Missiological Reflection #17 (April 2002) Many missions churches are like potted plants. They are merely transplanted replicas of those found in sending cultures. Contextualized churches, on the other hand, are planted by sowing "God’s seed" in new soil and allowing the seed to grow naturally adapting to the language, thought processes, and rituals of the new culture. The Missionary as a Listener -- Missiological Reflection #18 (May 2002) This Missiological Reflection on The Missionary as a Listener reflects on responses to this reflection and describes how contextualization occurs in new church plantings. After describing responses to the previous MMR on Transplanted and Contextualized Churches, this reflection describes how contextualization occurs in new church plantings. Missionaries should not only be master teachers of the word of God but also effective cultural listeners. Instead of making cultural decisions unilaterally because of their life experiences as Christians and training as missionaries, they should serve as partners within the body of Christ and collaboratively work with the developing Christian community to develop church patterns that are both theologically responsible and culturally impactful. Church Renewal: From Caterpillar to Butterfly -- Missiological Reflection #19 (June 2002) What spiritual transformations must take place within local churches in order for them to reflect the redemptive nature of God? Many churches are like caterpillars. They are self-absorbed consumers who can only crawl in the earthlies. These type of churches must undergo a spiritual transformation to reflect the nature of God. Only then can they become like butterflies, drawing nectar from God and Christian community as they spread God's pollen from place to place. The Theological Foundation of Missiology -- Missiological Reflection #20 (July 2002) All missiological decisions must be rooted, either implicitly or explicitly, in theology so that they mirror the purposes and mind of God. Frequently, however, missions practitioners take the theological foundation of missions for granted. The Missiological Foundations of Theology -- Missiological Reflection #21 (August 2002) While Theology is the foundation for all good Missiology, Missiology is also the "mother of Theology." Theology is done in missional contexts in response to missional questions. The Changing Cultural Ethos of Latin America -- Missiological Reflection #22 (September 2002) A cultural transformation is taking place in Latin America as thousands of people leave Catholicism and become Evangelicals. This new cultural ethos is described in six areas: approach to culture, leadership, symbols, worship, cognitive approaches, and response to change. Evangelizing Folk Religionists -- Missiological Reflection #23 (October 2002) Who are folk religionists? Why are people are turning to popular religion for answers to everyday problems in postmodern culture? What is the message packaged and presented when teaching folk religionists? This MMR seeks to answer these significant questions. Cruciform Missionaries -- Missiological Reflection #24 (November 2002) Cruciform missionaries have died to self and become new people who are shaped by the cross, whose lives are being molded into the likeness of Christ. How then are they to live graciously with teammates whose personalities are vastly different? The Missional Helix -- Missiological Reflection #25 (December 2002) The Missional Helix describes the developing practice of ministry through spirals of theological reflection, cultural analysis, historical perspective, and strategy formation. These elements work together and interpenetrate each other in developing the practice of ministry. The Missional Helix: Example of Church Planting -- Missiological Reflection #26 (January 2003) The Missional Helix is a model of ministry which takes seriously theological reflection, cultural analysis, historical perspective and strategy formation. In this reflection Dr. Van Rheenen applies the Missional Helix to the practice of church planting. A Strange New Voice: Who are Missional Leaders? -- Missiological Reflection #27 (January 2003) Jim finds that although he is a graduate student in seminary he is missionally illiterate. He has been taught how to maintain an existing church rather than equip a church to engage its culture. A Theology of Power -- Missiological Reflection #28 (February 2003) Traditional discussions about spiritual warfare have left many questions unanswered: How does the essence of God's power differ from that of Satan's? To what degree and in what ways should missionaries among animists focus on power? When a pagan practitioner becomes a Christian leader, how should his perceptions and practice of power change? How does God use ministers as mediators of divine power? Encountering Religious Pluralism -- Missiological Reflection #30 (April 2003) Patricia struggles with the question, "Will God save people of all world religions?” Dr. Van Rheenen seeks to answer what is likely the most important religious question of our day. A Change of Life -- Missiological Reflection #31 (May 2003) Why does a 57-year-old tenured professor step out of the classroom and into ministry? Read about a call and a passion. The need. A philosophy of ministry. Goals for training. Types of church planting. Modernity Sweeps Africa -- Missiological Reflection #32 (November 2004) Another cultural wave, perhaps more powerful than either traditional animism or revitalizing theism, is now sweeping Africa. This spreading force is not verbalized. It is almost imperceptible but nevertheless real. This new cultural wave is secularism. Imagining Christ’s Church in the City -- Missiological Reflection #33 (December 2004) Christianity has become so mingled with Modern thought and culture that it no longer speaks to many post-modern peoples. This article describes these syncretisms by answering the question, "What does the church look like if it truly reflects the nature of Christ?" Contrasting Missional and Church Growth Perspectives -- Missiological Reflection #34 (January 2004) A missional approach to ministry stands in obvious contrast to the traditional Church Growth perspective. This Missiological Reflection contrasts the two philosophies of ministry and their philosophical undergirdings. Dream the dream . . . again -- Missiological Reflection #36 (February 2005) Dreams for Christian leadership are lost. Van Rheenen calls us to dream again. Dream about a journey with God, a journey in community, a journey in ministry. Unspeakable Pain -- Missiological Reflection #37 (February 2005) Gailyn and Becky Van Rheenen struggle with spiritual realities upon the tragic death of Jonathan, their oldest son, father of two children, aged 20 months and 8 months. Why does evil happen to the people of God? Contextualization and Syncretism -- Missiological Reflection #38 (March 2007) (See reader responses) This latest reflection overviews the new book Contextualization and Syncretism (William Carey Library, 2006), edited by Dr. Van Rheenen. The authors of this text are concerned that the Evangelical Movement, molded by modern rationalism and the desire for relevance, frequently truncates, abuses, and loses the essence of the gospel. Spiritual Formation in Church Planting -- Missiological Reflection #39 (July 2007) Ancient practices of spiritual formation have been largely lost in contemporary culture. Therefore, Mission Alive's community of church planters (www.missionalive.org) continually envision and develop, with God's creative imagination, contemporary practices of spiritual formation. Two of these are discussed in this Missiological Reflection: Renewal Retreats and Formations Groups. Case Study: Translating God in Mongolia -- Missiological Reflection #40 (November 2007) What one group perceives to be syncretism is seen as authentic contextualization by other groups. This reflection guides those of us who are students of missions to differentiate what is the difference between contextualization and syncretism. "Christian" New Agers: A Growing Phenomena -- Missiological Reflection #41 (May 2008) This reflection is a real-life story describing North American Christians who unconsciously absorb Eastern and animistic beliefs that lead them to perform practices that dethrone God as Lord. A series of posts on the missional helix written in connection with Missions: Biblical Foundations and Contemporary Strategies, 2nd ed. Gailyn Van Rheenen with Anthony Parker, Missions: Biblical Foundations and Contemporary Strategies, 2nd ed. (Grand Rapids: Zondervan, 2014). The 2nd edition of Missions: Biblical Foundations and Contemporary Strategies (Zondervan/Harper Collins) is a handbook of missions, similar in some ways to Perspectives of the World Christian Movement, but written by one author, to describe the process of Christian servants becoming incarnational leaders planting and nurturing missionary movements. This 2nd edition has eight new chapters which provide models and illustrations from both domestic (North America) and international missions. Missions guides prospective and on-the-field missionaries (1) to attune their hearts to the narrative of the missionary God in the Bible—to embody the stories of missio Dei, kingdom of God, incarnation, crucifixion and resurrection, (2) to spiritually transform their lives into God’s likeness, (3) to discern personal motivations for carrying the mission of God, (4) to learn from missionaries who have gone before—in each of the six epochs of the historical expansion of Christianity, (5) to learn how to be learners as they enter a new culture (even within their home culture), (6) to confront personal feelings of ethnocentrism so that they might communicate to those of another culture as equals, (7) to communicate God’s eternal message in cultural categories that are both meaningful and effective, (8) to minister using a process of theological reflection, cultural analysis, historical perspective, and strategy formation within the context of spiritual formation in what is called “the Missional Helix,” (9) to learn basic incarnational principles for planting churches, nurturing new believers, and training leaders, (10) to apply these principles to the specific contexts in both Africa and North America; (11) to provide guidelines for effective short-term missions, (12) to discern the wise use of money in missions; and (13) to determine fundamental criteria for selecting sites for missions. The goal is that this book will equip leaders to plant and renew hundreds of churches, thereby catalyzing movements of discipleship and mission. The story of Jim and Julie, in narratives interwoven throughout the book and in the epilogue, illustrates a journey of spiritual transformation to become incarnational missionaries. Missions equips and inspires learners to become leaders transforming the world. The books serves as a guide to future and current domestic or international church leaders and church planters and as a text for the core missions course in an undergraduate program on the Junior/Senior level or an introductory text on the graduate level. 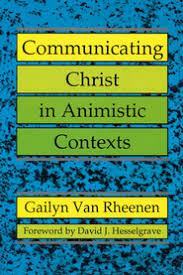 In this book Van Rheenen presents a comparative analysis of western dualistic secular culture and its worldview with the dynamic integrated worldview of what are often referred to as “traditional” or “animistic” peoples. He explains the characteristics of an “animistic” understanding of the world in such a way as to clarify how characteristics of this worldview are found in various cultures, not just “traditional” ones. The full text can be accessed on Folk Religion page of this site. 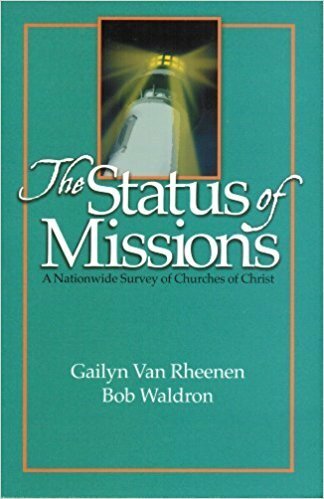 Gailyn Van Rheenen and Bob Waldron, The Status of Missions: A Nationwide Survey of Churches of Christ (Abilene, TX: ACU Press, 2002). Written to encourage and guide Churches of Christ to become missionary fellowships, the book is both descriptive and prescriptive. It reports the current status of missions among Churches of Christ and personal interviews of 80 mission leaders and missions ministries. It also describes theological and strategic guidelines to encourage and guide local churches toward effective missions involvement. Stories of effective missions churches enable the reader to understand the nature and character of redemptive churches. Gailyn Van Rheenen, ed., Contextualization and Syncretism: Navigating Cultural Currents, Evangelical Missiological Society Series 13 (Pasadena, CA: William Carey Library, 2006). Culture’s influence upon Christianity is easier to discern in retrospect than in prospect. If history is our guide, one thing is sure: This age will be as syncretistic as any other…How is the gospel being contextualized in the contemporary world? To what degree are these new contextualizations syncretistic? This book attempts to answer these questions by defining and analyzing contextualization and syncretism. Although the church growth movement has made a significant impact on evangelicals over the past half century, it has also created controversy and division. This careful five-view analysis helps evangelicals understand the movement’s strengths and weaknesses and arrive at their own conclusions on issues that affect the future direction of the church. 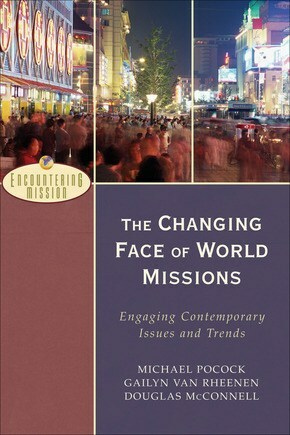 Michael Pocock, Gailyn Van Rheenen, and Douglas McConnell, The Changing Face of World Missions: Engaging Contemporary Issues and Trends, Encountering Mission (Grand Rapids: Baker Academic, 2005). The dramatic changes that have taken place both in global society and in the church have implications for how the church does missions in the twenty-first century. These trends include the rise of postmodernism, the spiritual decline in the West and the advance of the gospel in the rest of the world, and the impact of technology on society and missions. The Changing Face of World Missions is for the mission-minded church leader or lay person who wants to understand these trends. Each chapter identifies and evaluates a trend, examines it in light of Scripture, and proposes a practical response. Important terms are defined, and sidebars help readers think through the issues on their own.Co-authored by Dr. Michael Pocock & Dr. Van Rheenen.